In 'Damascus,' A Chilling Mystery With A Personal Connection Deborah Campbell's A Disappearance in Damascus is both a taut detective story and an intimate account of friendship during war — and that's before our reviewer discovered her own part in the story. 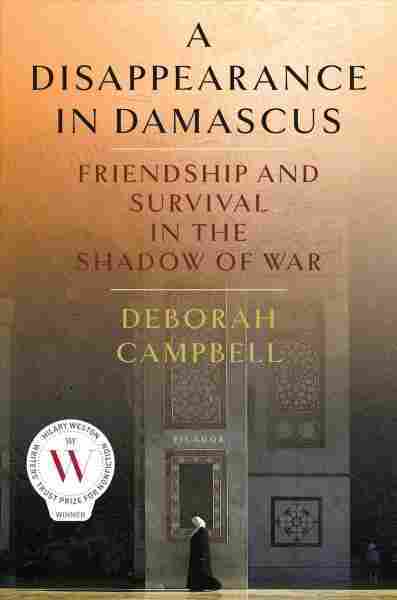 In this riveting detective story, Vancouver writer Deborah Campbell goes undercover in Syria in 2007. At first, she is a journalistic sleuth: On a tourist visa in Damascus, her aim is to collect the stories of Iraqis fleeing to Syria as the brutal war in Iraq drives more than a million civilians across the Syrian border, stories that depict the legacy of the U.S. invasion. It will be four years before Syria begins to come apart — but the signs are there, as past and future conflicts converge. Campbell's goal is to quietly immerse herself in the Iraqi exile community, but she needs a translator and guide. She befriends Ahlam, a brave and resourceful Iraqi refugee who can smooth the way. But her real detective work begins when Ahlam suddenly disappears into Syria's vast prison system, seized by the dreaded intelligence police. Why was she taken? Campbell is convinced their friendship has put Ahlam in grave danger. Compelled by guilt and obsession, she begins a fraught undercover quest to free her friend. A Disappearance in Damascus is a true story, but the truths go deeper than just the disappearance of a fixer and a friend. As Campbell writes in the opening paragraphs, Ahlam had taken her to a hidden world, "into the increasingly unstable country of Syria where she had sought refuge from Iraq." She had "showed me what survival looks like with all the scaffolding of normal life ripped away." Campbell reveals the intimate relationship between journalist and fixer — and, more tellingly, unravels a darker truth about how a paranoid security service can terrorize those on both sides of a prison wall, including a Canadian writer who believes she has the protection of a Western passport. "The paranoia of the state had been reproduced in my psyche," she writes, and in the claustrophobia of Damascus, Campbell is engulfed by that paranoia: "I now interpret every event as a message." A power cut to her apartment, a foiled attempted break-in; all possible proof that she's somehow to blame for Ahlam's plight. As it turns out, Campbell's masquerade as an academic on vacation fooled the security police, but she wouldn't learn the full story until much later. A Disappearance in Damascus can be read on a number of levels. I read it on a personal level, because, in full disclosure, I profiled Ahlam in a radio report that was broadcast on September 11, 2007 — and I eventually hired her as a fixer myself. Ahlam opened doors I needed to get through as I reported on the exodus of middle-class Iraqis following the U.S. invasion. Unlike Deborah Campbell, I was working officially, on a journalism visa issued by the Syrian Embassy in Washington, D.C. Campbell is a lanky blond Canadian, a standout in any Arab country. I am short and dark-haired, and I always trusted I could somehow blend in, embed myself and report unnoticed — even in Syria, with its multiple intelligence agencies. I knew I was under some surveillance. I didn't know how much. For me, reviewing this book would be almost impossible without giving some details away. If you don't want to know more — if you want to avoid any spoilers, then stop here. For everyone else still reading, Ahlam was eventually freed. And Campbell discovered that her arrest had more to do with me, the American reporter, than with her work for the Canadian Campbell — who'd convinced Syrian authorities she was an academic (true) coming to Damascus only to tour Syria's historical sites (not true). "Why did they arrest you?" Campbell asks Ahlam, once she's safely out of Damascus. "They wanted me to spy on a journalist. Not you. Deborah Amos, from NPR." For me, it was chilling to read that sentence. Ahlam declined, but I am now convinced that others I worked with in Damascus did not. I, too, formed close bonds with my fixers, relationships built on trust. Some became close friends. I have been banned from officially traveling to Syria for more than five years. I imagine a thick security file of random observations on my activities, furtively delivered by someone close, landed me on some black list. The thought haunted me as I finished the book. But even for those who don't have a personal connection to the Syrian story, Disappearance is a great read. It's a taut detective story, and an intimate account of friendship in the paranoia of a coming war.